If you're looking for a fun alternative to regular gift wrapping paper that isn't as wasteful, why not try the shirt off your back? 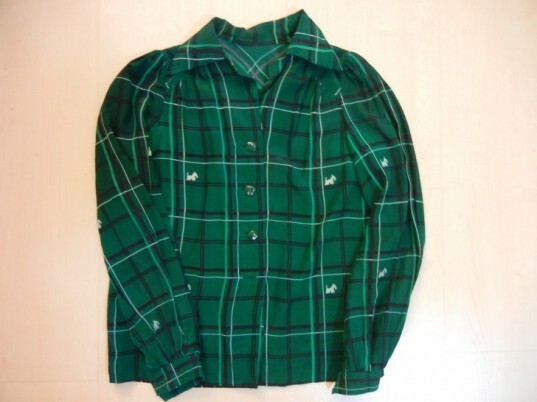 Okay, so you don't actually have to use the one you're wearing right now; any old shirt that you no longer need will do - as long as it has long sleeves. We applied a technique from the ancient Japanese art of furoshiki (cloth-wrapping) to a shirt to create a simple satchel to present and carry a gift in, and you can too with our DIY instructions. We're sure that the recipient will be intrigued by this unique packaging, which they can reuse or even wear, and you'll always be able to remind them of the time that you gave them the shirt off your own back. – A long sleeved shirt. The thinner the shirt, the easier it will be to turn it into a satchel. Lay your shirt flat on the floor. If your shirt has buttons, we suggest laying it button side up, but after you try out your furoshiki satchel once, you can see which you prefer better. You can always untie it and redo it! Orient your shirt the way the one in the pic above is with the lower corner facing away from you. Then place your gift in the the center of your shirt so that the edges of it are perpendicular to the corners of your shirt. In other words, the corner of your gift should not be facing the same way as the bottom corners of your shirt (see pic). 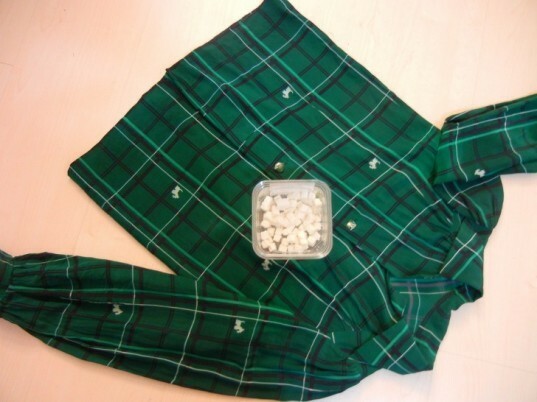 Fold the top 1/6th of your shirt or so down (see pic) so that your shirt looks more like a square. 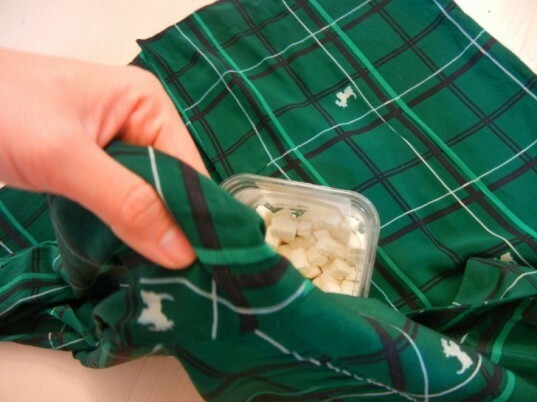 Fold the corner of the shirt closest to you over your gift so that it covers it and then tuck it under just a bit. Then tuck the fabric under your gift just a bit. Next grab your sleeves and gather them together tightly towards your gift. Tie the sleeves in a knot at the top of your gift. Try to make sure they are even on both sides. 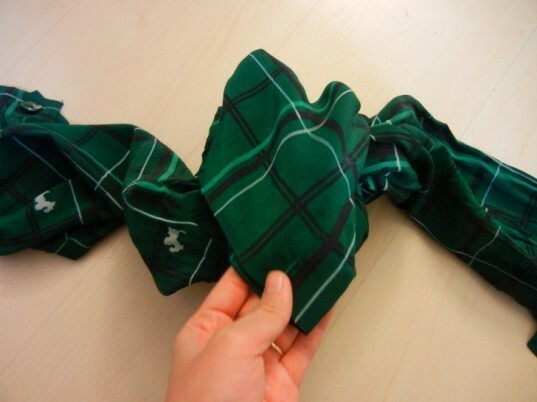 Once you’ve tied your knot, fold the far corner of your shirt over it to hide it. Then take one of your sleeves (it doesn’t matter which) and twist it until it’s taught. While holding that sleeve so that it doesn’t unravel, twist the other sleeve up too. Tie the ends of your sleeves together. You can leave your knot as is or you can create a more decorative rosette like this one by tucking the edges in under one another. And there you have it! 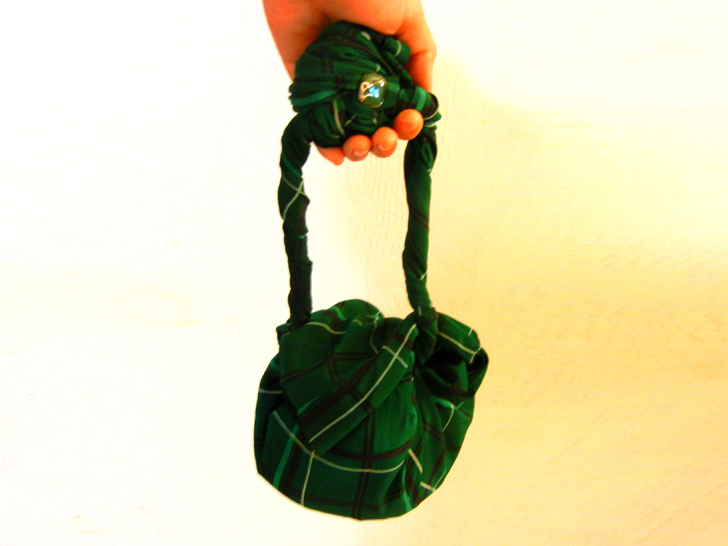 Pick your furoshiki satchel up and deliver it to a friend. Lay your shirt flat on the floor. If your shirt has buttons, we suggest laying it button side up, but after you try out your furoshiki satchel once, you can see which you prefer better. You can always untie it and redo it! Then place your gift in the the center of your shirt so that the edges of it are perpendicular to the corners of your shirt. In other words, the corner of your gift should not be facing the same way as the bottom corners of your shirt (see pic). 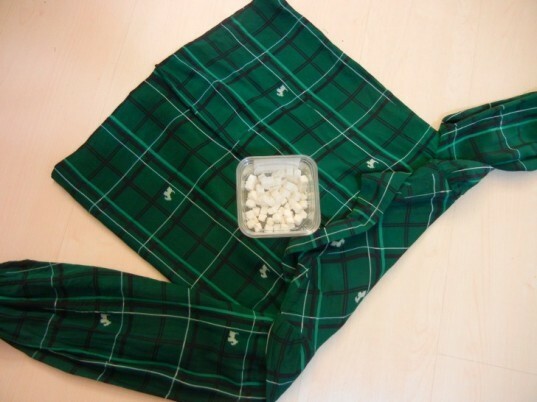 STEP 2: Fold the top 1/6th of your shirt or so down (see pic) so that your shirt looks more like a square. 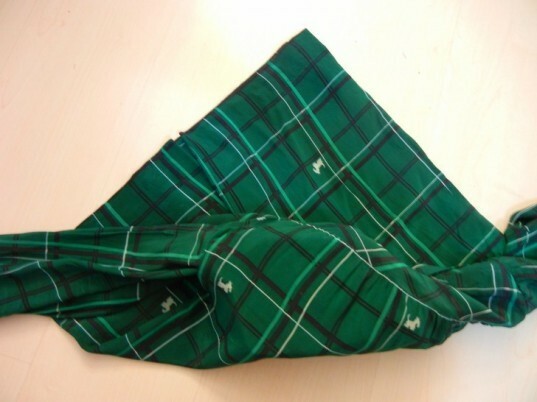 STEP 3: Fold the corner of the shirt closest to you over your gift so that it covers it. 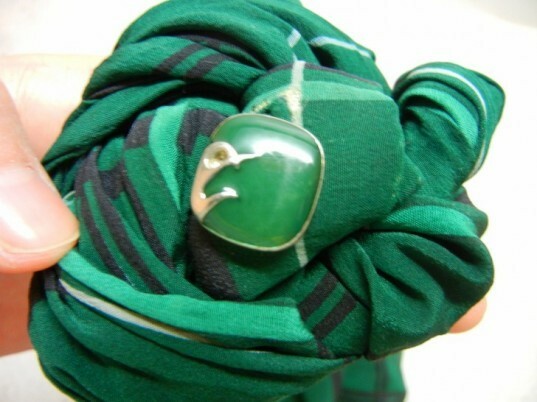 Fold the corner of the shirt closest to you over your gift so that it covers it. STEP 4: Then tuck the fabric under your gift just a bit. STEP 5: Next grab your sleeves and gather them together tightly towards your gift. STEP 6: Tie the sleeves in a knot at the top of your gift. Try to make sure they are even on both sides. 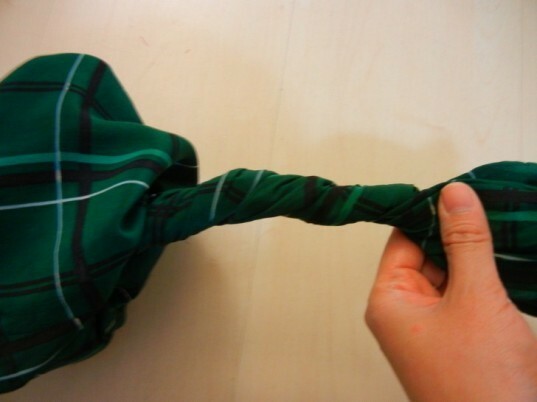 STEP 7: Once you've tied your knot, fold the far corner of your shirt over it to hide it. Once you've tied your knot, fold the far corner of your shirt over it to hide it. STEP 8: Then take one of your sleeves (it doesn't matter which) and twist it until it's taught. While holding that sleeve so that it doesn't unravel, twist the other sleeve up too. Then take one of your sleeves (it doesn't matter which) and twist it until it's taught. While holding that sleeve so that it doesn't unravel, twist the other sleeve up too. STEP 9: Tie the ends of your sleeves together. You can leave your knot as is or you can create a more decorative rosette like this one by tucking the edges in under one another.